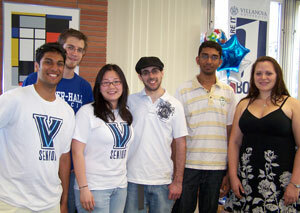 Falvey celebrated its student employees with a luncheon on April 7. Of the 85 students who work in the library, ten are graduating. They are Grace Y. Bae, Access Services; Jeffrey B. Eisenberg, Access Services; Kent M. Grosh, Access Services; Ryan A. Mancino, Events & Outreach; Clare B. Oven, Access Services; Tahir Qadeer, Access Services; Christine K. Simmons, Access Services; Phaninder Surapaneni, Systems/Technology Management; Christopher Volpe, Access Services; and Jayne Ziemba, Access Services. Ryan Mancino won the drawing for two gift certificates to Gullifty’s Grille & Bar. Library staff and supervisors also attended, demonstrating their appreciation for a job well done. The Falvey’s Student Employee Appreciation Committee (SEAC) sponsored the annual event. For information about student employment in the library, contact Mary Heyman in the director’s office. Student employees are the backbone of library operations. We couldn’t provide high quality services without their help!